I recently changed my ISP from Earthlink to Verizon. Because I had been with Earthlink for over twelve years, my Earthlink homepage contained a lot of material that I decided to move to my Typepad blog (which is where you are now, of course). But some of that mass of material was also out of date, and so I've been going through old files in order to decide what to keep and what to throw into the digital trashcan. As I was revising my CV, I was reminded of my first academic publication, which was a review of the Reclam edition of Kant's Prolegomena to Any Future Metaphysics That Will Be Able to Come Forth as Science. The odd thing about my review was that I wrote it in German. Consequently, my first academic publication was in German, even though English is my native language. There's a little story behind how this happened, and I thought that you might enjoy reading it. So here it is. When I was living and studying in Munich, I shared an apartment with a German political philosophy student who was also the co-editor of the HfP-Zeitung, which I guess you could call the once-a-semester student magazine of the Hochschule für Politik. (Or at least that's how I remember it. I apologize if I've misremembered.) He had a copy of Kant's Prolegomena for review, and since I too was a philosophy student, but one who specialized in German idealism, he asked me to write a short review. Naturally, my prose was imperfect, but my roommate was kind enough to correct my mistakes (which he had to do anyway, since he was co-editor of the magazine). My review was then published in the winter semester issue of the 89/90 academic year, and so there I was with a little piece in German that also happened to be my first academic publication. My review covered slightly more than one page of the magazine. I've scanned the two pages and uploaded the images below. I erased another review that appeared at the bottom of the second page, just in case the author (my roommate the co-editor, in fact) doesn't wish it to be reprinted without his permission. It was really not much more than a bit of fun, but it was a worthwhile exercise that no doubt contributed to improving my German, which, after all, was why I was studying in Germany in the first place. If you would like to download the review as a single PDF (1.3 MB), then click on this link. In mid-2007 I agreed to work as one of the translators of an anthology of the work of the German-Jewish philosopher Moses Mendelssohn. These things take time to see the light of day, and so only recently has the book been published by Brandeis Universty Press. 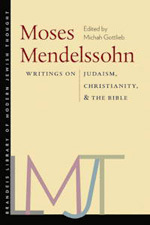 The book is entitled Moses Mendelssohn: Writings on Judaism, Christianity, and the Bible and includes a wide selection of Mendelssohn's work from 1769 to 1786. Michah Gottlieb edited, introduced, and annotated the book. Elias Sacks did the translations from Hebrew, and I did the new translations from German. I also made some suggestions for slightly revising the excerpts from Allan Arkush's 1983 translation of Mendelssohn's Jerusalem. My new translations make up roughly forty percent of the book as a whole. This page will provide you with the full table of contents. I translated selections 1-3, 5, 6-8, 10, 11-13, 15-16, and 20-25. Thomas Frank revisits Richard Hofstadter's "The Paranoid Style in American Politics." He deftly applies Hofstadter's essay to some of our present-day political turbulence. Unfortunately, Hofstadter's original, archived article is only available to subscribers of Harper's Magazine. As far as I can tell, this is the closest that you can get to it without a subscription. But I noticed that what seems to be the full text of the article has been posted here. Toward the end of Frank's article you'll see that he mentions that Hofstadter also referred to the right-wing paranoid as a pseudo-conservative. This put me in mind of Theodor Adorno's analysis of pseudo-conservatism in The Authoritarian Personality. And so I wonder whether or not Hofstadter was familiar with this book. I assume that he was. You can find Adorno's main discussion of pseudo-conservatism in Part IV, chapter XVII, section B, subsection 4, which, at least in my edition of The Authoritarian Personality, begins on page 675. Here's a quotation from page 676 to get you started: "The pseudoconservative is a man who, in the name of upholding traditional American values and institutions and defending them against more or less fictitious dangers, consciously or unconsciously aims at their abolition." Update - November 30, 2015: Good news! Hofstadter's entire article is now available for free in the Harper's archive. From time to time over the past few years I've mentioned that Yolanda Estes and I have been working on a book about the German philosopher J.G. Fichte. It's been a long haul, but it now looks as if J. G. Fichte and the Atheism Dispute (1798-1800) will be published in March 2010. Our book is a collection of translations and commentary devoted (as the title plainly indicates) to Fichte and the atheism dispute, a pivotal event not only in Fichte's philosophical career but also in the history of German idealism as a whole. The complete manuscript is at the press, and so right now Yolanda and I are working through the production process. This page on the Ashgate website will give you more information about the book and its contents. In an earlier post to my blog I published a review of Simon Blackburn's Truth: A Guide. I mentioned that I had written the review for a journal, but that I had withdrawn my manuscript after it was butchered by an amateurish editor. Instead of letting my work go to waste, I posted the review to my blog. I figured that someone out there might be interested in what I had to say about Blackburn's book. Since I'd like to get even more mileage out of my review, I'm writing this post in order to lead people to my review from another angle. In chapter 4 Blackburn takes on the issue of Nietzsche's alleged relativism. I was rather unhappy with this portion of the book because I consider it unlikely that Nietzsche was a relativist. It's not just blatantly obvious that he wasn't a relativist, but a bit of reflection leads, in my considered opinion, to the conclusion that he didn't subscribe to relativism. My review briefly explains my reasoning. If you're reading Nietzsche and would like to learn more about this topic, go to my review and scroll down to my discussion of chapter 4. Update - February 24, 2010: My review can now be found in the March 2010 issue of Other Voices. Book Notes: My Review of Simon Blackburn's "Truth: A Guide"
A couple of years ago I was asked to write a review of Simon Blackburn's Truth: A Guide. I won't mention the name of the journal that contacted me, so I'll just say that it isn't one that usually deals with philosophical subjects. I diligently went to work and submitted two drafts of my review, only to have the second draft butchered by an amateurish editor. At the time I was so busy with more pressing work that I simply withdrew my manuscript. I had better things to do. But like any author, I hate to let my work go to waste. Consequently, I thought that I should post the review to my blog. After all, someone out there might take an interest in it. Please note that my pagination refers to the hardback edition. If you're so inclined, you can download the review as a PDF file (14 KB). Because I'm a regular reader of the print-edition of The New Republic, I read this article by Anne O'Donnell (subscription-only, unfortunately) long before I found it on-line. (In fact, this post encouraged me to find the web version in order to link to it.) I mention O'Donnell's article because it alerted me to the lecture that Helen Vendler recently gave as the 2004 Jefferson Lecturer in the Humanities. Professor Vendler's lecture is available on-line. Her topic is the humanities, in particular the humanities as they are practiced at today's colleges and universities. Professor Vendler addresses various interesting questions throughout her lecture: What are the humanities to study? What value do they possess? How are they to influence students? And so on. She answers her questions via readings of several poems by Wallace Stevens. Since I have devoted my adult life to the study of the humanities, I was glad that Professor Vendler discussed them in a public forum. (By the way, the Jefferson Lecture is sponsored by the NEH.) Prominent academics with a public profile don't do enough to defend and promote what they do for a living. So that's all to the good. But Professor Vendler makes several remarks about philosophy (which is my discipline) that I find puzzling. I'll quote from her first three paragraphs and then say something about them. When it became useful in educational circles in the United States to group various university disciplines under the name "The Humanities," it seems to have been tacitly decided that philosophy and history would be cast as the core of this grouping, and that other forms of learning--the study of languages, literatures, religion, and the arts--would be relegated to subordinate positions. Philosophy, conceived of as embodying truth, and history, conceived of as a factual record of the past, were proposed as the principal embodiments of Western culture, and given pride of place in general education programs. Confidence in a reliable factual record, not to speak of faith in a reliable philosophical synthesis, has undergone considerable erosion. Historical and philosophical assertions issue, it seems, from particular vantage points, and are no less contestable than the assertions of other disciplines. The day of limiting cultural education to Western culture alone is over. There are losses here, of course--losses in depth of learning, losses in coherence--but these very changes have thrown open the question of how the humanities should now be conceived, and how the study of the humanities should, in this moment, be encouraged. I want to propose that the humanities should take, as their central objects of study, not the texts of historians or philosophers, but the products of aesthetic endeavor: architecture, art, dance, music, literature, theater, and so on. I'm all for the study of the arts, which is why I repeatedly taught courses in aesthetics when I was still a professor. It's what Professor Vendler says about the status of philosophy that puzzles me so. But I'll start with a couple of minor quibbles. First, to say that philosophy embodies truth doesn't really distinguish it from history or most of the other humanistic disciplines, since, presumably, like philosophy, they aim at producing truths rather than falsehoods. I guess, though, that she means something suitably high-minded: Truth with a capital 'T', as Richard Rorty might say. Second, Professor Vendler's observation that historical and philosophical assertions are made from particular viewpoints is obviously true. No one has ever really argued otherwise, although many historians and philosophers have thought  rightly, if you ask me  that they could overcome their own particular particularity, if you will, in their efforts to produce knowledge claims of various sorts. The point is to work within the boundaries of our fallibility, individually or collectively, in such a way that we minimize the risk of error and maximize the possibility of arriving at the truth. All of us do this all the time. The real problem here, though, is that Professor Vendler seems to be asserting that the particularity of the viewpoint from which a claim to knowledge issues is itself a sufficient ground for challenging the view. This is the sort of mediocre epistemology that one finds all too frequently outside of philosophy departments. The finitude of the person making a claim to knowledge is never a sufficient ground for challenging what that person has said, because such finitude characterizes everyone who makes a claim to knowledge. A challenge has to be based on reasons that directly address what has been claimed. Airy observations of the post-modernist sort that we are all historical beings living in a particular place and time give us at best a motive to suspect what others say. By themselves, though, they aren't objections. Historical tales aren't sufficient for undermining someone else's claim or arguments. If they were, then nothing would be worthy of belief. I'll get off my anti-postmodernist hobbyhorse  Whoa! Steady there!  and move on to what really bothers me about Professor Vendler's lecture. After all, what I've just discussed is found in her brief opening remarks, and so perhaps none of it was meant too earnestly. We might think of it as a bit of theoretical throat-clearing. Therefore, let's look at her remarks about philosophy. Here's my question: Since when was philosophy one of the two central objects of humanistic study in our colleges and universities? Professor Vendler wants to shift the focus from history and philosophy to "the products of aesthetic endeavor." Well, as regards philosophy, that ship sailed a long time ago. A philosophy department is typically much smaller than a history or an English department, and typically has fewer majors than either of these other two departments. There might be some schools where this is not the case, but I assure you that such places are the exception, not the rule. Just go to a good bookstore and look at the philosophy, history, and literature sections. You'll quickly see which of the three is the smallest section. In some understandings of the humanities, yes, it's true, philosophy is accorded a central, foundational role, but the actual practice of institutions of higher education relegates philosophy to an increasingly minor role in the intellectual lives of their students (and has been doing so for a long time). The situation has became so bad in recent years that applied ethics has become the fastest growing area within philosophy, as philosophy departments struggle to demonstrate to their deans that they're usefully contributing to the careerist ambitions that today's administrators harbor for today's students. If what I've just described isn't the case at your institution of higher learning, then I suspect that you're studying or teaching at the University of Paris and Thomas Aquinas is on the faculty. Two former students, both of whom studed Max Horkheimer & Theodor Adorno's Dialectic of Enlightenment with me, have emailed me about this story in The New York Times. It's about a new Canadian documentary called The Corporation. I should say that I haven't seen the film. In their 1944 work, ''Dialectic of Enlightenment,'' Max Horkheimer and Theodor Adorno advanced a theory on the far-reaching power of what they called ''the culture industry.'' This entity, encompassing all forms of mass culture, media and the businesses behind them, made up such a totalizing system that it was literally impossible to rebel against it. This complex not only anticipated the urge to revolt but would sell you something to satisfy it. (Che Guevara T-shirt, anyone?) It's a resoundingly depressing theory but an interesting one to recall, because anticorporate sentiment is lately prominent in pop culture. The film is said to be the latest example of this anticorporate sentiment. It might be worthwhile, but I haven't yet heard from anyone who has seen it. If it comes to Dallas, then I could see it. My hometown is too small for the local theaters to feature a documentary. Towards the end of the article there is some fulminating about the possibility of dissent within the confines of the culture industry. As far as I'm concerned, this wasn't one of Max Horkheimer and Theodor Adorno's major concerns. They were more worried about the transformation of autonomous art (as they labeled it) into a form of mere entertainment that is simply an extension of the working day. (That is, to fudge the theory a great deal, we amuse ourselves in the evening to rest up for the next day's labor.) Naturally, that change would have an effect on what people want to read and watch, and, presumably, the political content would usually be low or non-existent. But since Horkheimer and Adorno never saw the primary purpose of autonomous art in a straightforwardly political light, the absence of dissent in the products of the culture industry isn't their main concern. Many of the greatest works of art have no obvious political content or ambition. Horkheimer and Adorno were well aware of that. Anyway, I was glad to see discussion of their book turn up in a piece in the The New York Times. I'm currently talking with an editor about writing a monograph on Dialectic of Enlightenment. It's one of my favorite works in 20th century continental philosophy, and no one has ever tried to comment on the book from start to finish. I taught it numerous times over the years, and now I'd like to write something about it. If you haven't seen Preston Sturges' Sullivan's Travels, then go out and find it. Once you see it, you'll understand why I brought it up in this paragraph, given the overall context of this post. Acknowledgment: Many thanks to Jonathan Church and Ross Lerner for alerting me to the article in The New York Times.